The 13" Sun Rings works the same as the small ring, but at a much faster and higher rate. By having the client stand within this ring, crystals, herbs, intent etc. can all be placed inside to "send" energy into the client's body. This ring can also be placed under a massage table with a crystal or intent to enhance a massage or body work. The gold and platinum rings work pretty much the same. 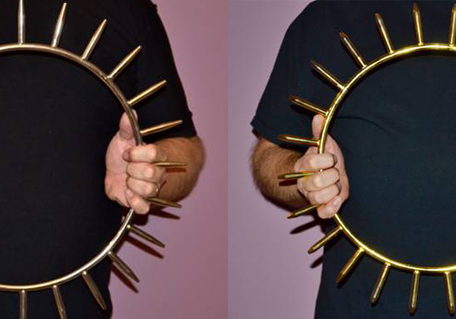 The benefits of the gold ring is to use it after a session to remove "energenic residue" from the client. It is also benificial to use in tandem with the platinum ring (platinum on the floor between the feet and gold over the head) to form a "battery". This will work at a higher level to help loosen deep energies and entities. Get all the benefits of both rings and save $50 when buying both together.